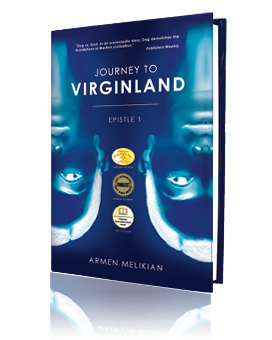 In Journey to Virginland, Armen Melikian’s debut novel, ancient mythology becomes an integral part of the narrative tapestry, at turns complementing and defining the odyssey of Dog, the protagonist. By tapping into the legacy of ancient mythology, this book which was published in 2012 to critical acclaim, recasts the personae dramatis and major episodes of humanity’s shared storytelling traditions as key backdrops to its plot, in the process addressing the modern dearth of discourse and study with regard to ancient mythology. A scholar of history, philosophy, religion, and myth, Melikian harnesses the capacity of ancient mythology to both inform and illuminate. While his antihero navigates through the reconfigured humanscape of the 21st century and strives to promulgate a new vision for the creative actualization of human potentialities, ancient mythology functions as a referential prism in terms of psychological truth, historical and linguistic points of departure, and spiritual compass. However, far from merely cherry-picking from among the most colorful stories, Melikian actually expands our understanding and knowledge of mythology, by bringing his considerable research and analysis into the mix. Thus the author fills numerous and crucial gaps in the study of mythology by reconstructing the key passages and stepping stones of ancient Greek, Norse, Indo-European, Roman, Babylonian, Sumerian, Iranian, Indian, and Armenian mythology. Moreover, Melikian breathes new life into ancient mythology by making extensive references to the origins and structure of the Zodiac as well as the Armenian epic tradition. Understand ancient mythology from a new perspective. Get your copy of Journey to Virginland today!